With the temperature cooling down the 3s competition was the hottest thing at the venues of The Vine and Fox Denchworth on Thursday. At the Fox four teams competed. Plum Pudding took Ab Utd B(A) two straight legs with Terry Downes hitting 5-4. Spread Eagle B(B) then took out the Tandem with 2 straight legs. 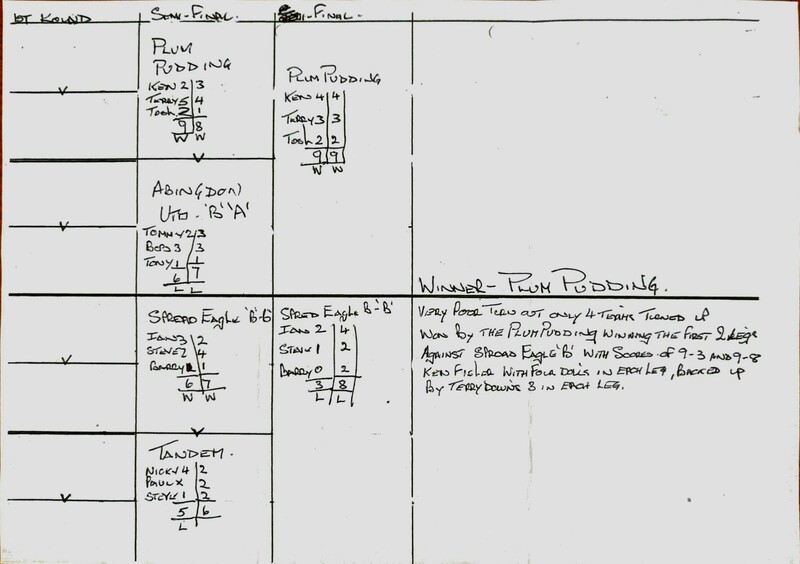 Plum Pudding then sealed the deal against Spread B(B) with 9 in each leg Ken Fisher doing 4’s and Terry Downes doing 3’s (and Tosh Woolloff doing 2’s). Plum Pudding go through to the final. At The Vine 7 teams turned up, the exception being the side from the Spread Eagle B (A). Ab RBL did come through and deservedly so. However it was the Ab RBL A of Sapey, Ealey, Champ (Gavaghan) rather than Ab RBL B that were due to be there. In this case we do need to make allowance for players from teams that really support the competitions so the decision to let them play was made. (We’ve also had no complaints about it either and the Plum are happy to play on). As for the events that unfolded in the first round the Tandem beat Ab Con Club, Berinsfield A bt Berinsfield B, and Abg RBL shocked Abg Utd to 3 legs. Ab Utd could only set 5 in the deciding leg. The Spread Eagle had the fortune or misfortune to draw a bye. In the last 4 Berinsfield A bt the Tandem and Abg RBL beat the Spread Eagle, again in 3 legs. In the match to make the final Abg RBL defeated Berinsfield A in 2 straight legs. Standing at one leg to Abg RBL and a tied second leg, a set of 6 with 3 sticks by the RBL side took them through. There were no sixes and no really high leg scores – the Spread’s 12 against Abg RBL was the best. The more favoured sides really struggled on the alley for some reason. P.S. It’ll be my intention to propose full competition rules to be adopted at the AGM in January – they’ll be published for comments beforehand. — Paul Stone Acting Secretary.